Home > Blog > Get The Facts: What Is Rosacea? Get The Facts: What Is Rosacea? Rosacea is estimated to affect one in 20 people. But many people still don’t understand what it is, the signs and symptoms. Here, we delve into the facts about this poorly understood long-term skin condition. Often mistaken for acne, eczema or some kind of skin allergy, Rosacea is a surprisingly common skin condition. 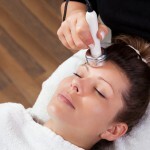 While it comes in lots of different guises, in all cases it causes an excessive amount of redness to skin on the face. Frustratingly, the cause of rosacea remains, in large part, a mystery. There have been many theories such as an overabundance of demodex facial mites in the skin’s follicles, or an imbalance of intestinal flora. But nothing has been proven conclusively. What we do know is that it’s mostly a problem for people with sensitive and/or pale skin. Symptoms may appear in your early 20s, but usually it’s in your 30s-50s. There are certain aggravating factors, such as sudden changes in temperature, sunlight, certain foods and drinks (like spicy dishes, caffeine and alcohol), and even stress. Rosacea is typically less severe in women than men. How do you know when you’ve got rosacea? Maybe your cheeks flush more, and for longer than they once did. Perhaps there’s an unusual rash on your face, or you’ve developed swollen eyelids. No individual with have exactly the same symptoms as the next, but there are some common signs that you may have rosacea. Not all signs occur in all cases, and many cases are mild. Flushing: Flushing episodes can be lengthy (up to five minutes) with the blush sometimes spreading down from the face to the neck and chest. Often the first symptom, flushing may well be the only symptom for years before any other signs develop. Facial skin hyper-reactivity: Often mistaken as simply “sensitive skin”, this is where blood vessels dilate very easily to triggers like touch and sunlight. With rosacea, it’s the sensitive blood vessels that are the cause, not skin cells. 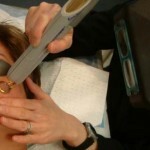 Persistent redness: Flushing may eventually lead to persistent facial redness. This can look like a patch of sunburn. The cause is the expansion (dilation) of hundreds of tiny blood vessels near the skin’s surface. Small lumpy red spots: Known as inflammatory rosacea, spots (papules) and small cysts (pustules) can appear on the face. This can look similar to acne, but there are no blackheads. In some cases, they come and go; in others, they stay long-term until treated. Inflamed blood vessels: Known as vascular rosacea, this occurs as rosacea progresses. Small blood vessels on the nose and cheeks swell (telangiectasia) and become prominent. Facial skin can also become blotchy. Rhinophyma: This is a rare complication of rosacea, and more common in males. It causes thickening of facial skin, especially around the nose, causing the nose to become bulbous and bumpy (rhinophyma). Eye complications: “Ocular rosacea” occurs in about 10% of cases. It can range from the feeling of having something in the eye to burning, stinging or itchy eyes, dryness and sensitivity to light. Other problems include cysts, styes or inflammation of the eyelids (blepharitis). Rosacea may also cause conjunctivitis. Some people may not tolerate contact lenses. In very rare cases vision may become blurred. Facial swelling: When too much fluid and proteins leak from the blood vessels, they eventually overwhelm the lymphatic system and cannot be drained away quickly enough. The result is fluid buildup in the skin, and facial swelling. If you think you have rosacea and want to speak to an expert, contact Sydney Dermatology Group.